Traveling with items at the back of your vehicle can be very tricky as it requires attention and you also need to be extra careful to keep the item safe and intact. Keeping the bed of your truck open while you travel can make your truck bed exposed to elements, and the weather plus the items at the back of your truck could be stolen, or it could fall off while you drive without you even noticing. The cargo or item that you carry in the back of your vehicle bed is sometimes the most valuable item that you own, which is why it is essential to protect it. A hard rolling tonneau cover is the solution you may consider and one of the possible items you want to buy, although it is outdated, could be Truxedo Titanium. Here in this article, we will thoroughly review Truxedo Titanium , help you find the best price on Truxedo Titanium and suggest you alternatives. Value for money 3/5: It may be costly but it is durable and effective. However, it is outdated. Ease of use 4/5: Easy to roll on and off and it can be done with one hand. Quality of build 4/5 : Can withstand harsh weather conditions. Features 4/5: Looks great on trucks and has a low-key design. Customer Service 4.5/5 : Easy to contact and they are quick to resolve issues. Who is Truxedo Titanium for? How to use the Truxedo Titanium? What are the alternatives to Truxedo Titanium? Conclusion: Do we recommend Truxedo Titanium? Truxedo Titanium is a hard rolling truck cover that protects whatever is in the back of your truck. It has a low-profile look which Truxedo is known for, and the cover fits your truck's styling while it remains unnoticeable from looking at the side profile. This product is very easy to roll up because it has the quick latch option that makes it simple to reveal the full-bed truck access in just a one-handed operation. The cargo straps are durable, and it can safely secure your cargo in the open position. 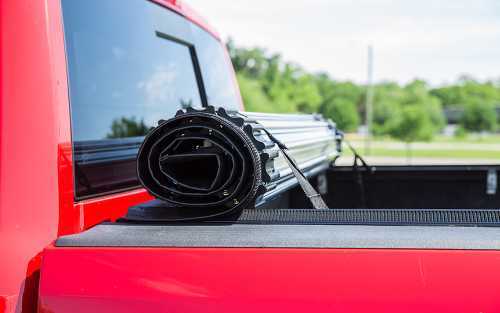 It also features a no-drill installation that is simple, so you can have the cover installed at the back of your truck in no time. You do not need special tools or drilling holes on the side of your truck. The cover immediately mounts to the side of your truck bed without blocking the stake pocket holes. It is very easy to install, and it has a protective film that remains in place during the installation, so you don’t have to worry about scratching your truck bed while you work with it. With this product, you get the security that you need for your items and your truck bed. It also has a dual-latching system that works on either side of the truck bed. The fabric of this product can withstand extreme temperatures. It can also operate efficiently. Protecting your load and making your truck this stylish? It is a good deal. This product has a warranty of up to 3 years. So you can contact Truxedo anytime through their email and company phone number that can be found on their website. Truxedo Titanium is a good way to keep your truck bed clean and your cargo safe. It can withstand harsh weather conditions and it is also scratch free. It can also hold up to 300 lbs of weight. Even though it has an instruction manual, some customers find it confusing to install and to use. This product is made especially for those who travel with important cargo in the back of their truck. This product with its low profile design and hard rolling feature is a great option for those who cant afford retractable covers but still wants their rear window open when the cover is closed. 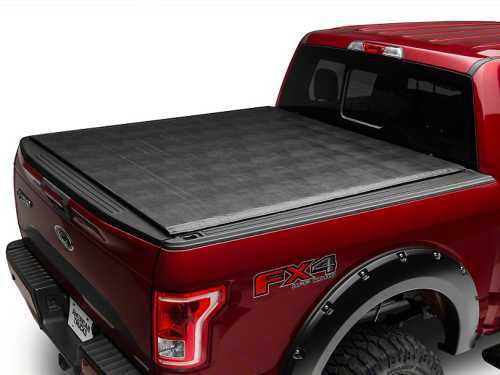 By the way, if you own an F150, you may find out Best F150 Truck bed Covers here in our article. ​This truck cover has a low-profile signature design, and it sits only around ¾ inches above the bed of the truck. The finish also enhances the appearance of your truck. It is also durable and stable because it uses bonded and linked aluminum slats, this truck cover has the ability to hold up to 400 lbs of weight that is distributed evenly. The Truxedo Titanium is UV resistant so that it can withstand intense heat, and it does not flap while you drive. It has an industrial grade leather grain that provides a great look. This truck cover is made out of vinyl and aluminum, and it allows you to keep your gooseneck, fifth wheel or other gears in your truck bed out of the different elements. For you to be able to access the truck bed, you need to roll it up and stow just behind the car. You just need to drop down your tailgate, and you need to pull down on the quick latch release, and you can begin rolling the cover-up. It has a hook and a safety strap that makes sure that it will remain in place while you are on the road. You need to hook it to the loop in front and pull it nice, tight and securely. Sometimes the vinyl may delaminate from the aluminum base which can cause the overall hinge mechanism to malfunction. Some may also find it a bit confusing to install. There are alternatives that you can try to keep your cargo safe while it is in the back of your truck. Aside from the titanium cover, you can go with Truxedo Sentry. This cover is one of the best hard rolling truck covers that you can purchase on the market. It can be installed easily and it gives you a full access to the bed of your truck. It can also protect it from elements, harsh weather conditions and theft. Another alternative is Tonno Pro Lo-Roll Tonneau Cover. This truck cover can be mounted inside the truck bed rails so that it could provide access for you to mount any of your accessories like side rails, tie downs, ladder racks and bike racks. Tonno Pro covers have the snap installation feature that lets you enjoy the product in minutes. You do not have to drill any holes on your truck and all that you will need is a ratchet and a 17mm socket. It also has a tear-resistant vinyl that is double sided with aluminum components that are grade powder coated and they have the best warranty in the industry. Sometimes you may need to haul an item and you would not want to remove the cover in your truck for easy access. For this kind of job, the Truxedo Titanium can be a nice addition to your vehicle but it is outdated. Therefore we do not recommend it and instead we recommend newer series of Truxedo Sentry or Truxedo Sentry CT.